Using a melt and pour soap base, you are at the mercy of the manufacturer. There are standard soap bases and even shaving soap bases. The main variant you can make with melt and pour is to add clay. The clay helps give the soap extra "slip" and also works to purify your skin (think of a clay or mud mask). You don't want to add any extra oil, as that will diminish the lather. You might also want to make your shaving soap from scratch using a cold process shaving soap recipe. This recipe produces a solid shaving soap contained in a mug or tin. To use it, a shaving brush is wet with hot water, then rubbed on the soap in a circular motion to produce the lather. Then the gentleman applies the lathered brush to his face before shaving. Melt and pour soap base: You can use a plain white base or shaving, clear, aloe, goat's milk, or other bases. 2 tablespoons of clay per pound of soap base. Bentonite clay is preferred, though you can use kaolin, rhassoul clay, or fuller's earth. 1 teaspoon of liquid glycerin per pound of soap. The glycerin helps build the volume and stability of the lather and adds a bit of moisturizing. Fragrance or essential oil appropriate for the person using the soap. Be sure that it's mild enough for sensitive skin, such as a light combination of lavender, orange, and patchouli. Basic understanding and equipment for melt and pour soap making including a double boiler or microwave as a heat source, metal whisk, rubber spatula. Assemble your equipment and supplies. Melt your soap base in the microwave or a double boiler. Once it's melted, add 2 teaspoons of clay for each pound of soap base you've melted. Stir well, making sure that all of the clay gets dissolved. Add in the glycerin and your fragrance or essential oil and stir. Pour it into your mugs or cups. If you have a lot of bubbles from stirring, just spritz them with a bit of rubbing alcohol. When the soap has cooled and thickened a bit, give it one more gentle stir. The clay can sometimes have a tendency to settle to the bottom of the mug. Experiment with different clays, soap bases, or fragrances. They'll all be just a little bit different. 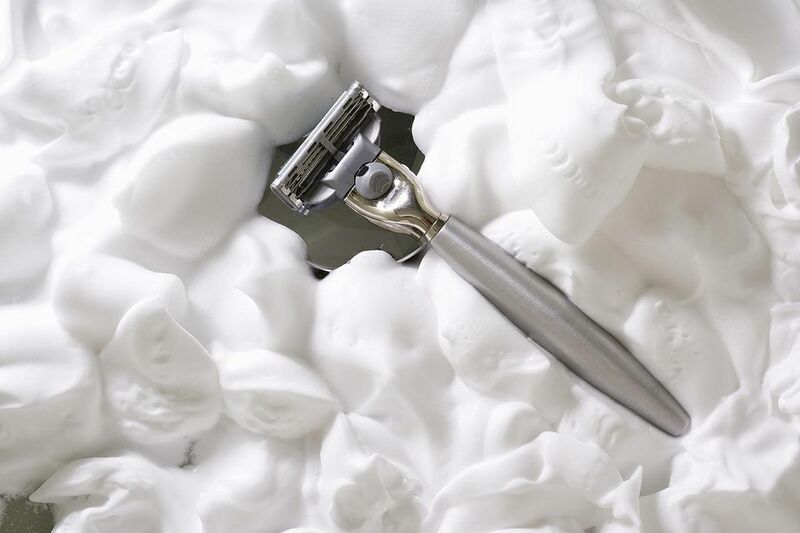 Remember that a real shaving soap is not going to be as foamy as a commercial shaving cream—but with the clay, it has just as much "slip."